This was the first universe that I ever created a fanfiction for, back before I even knew what fanfiction was. It was intended to be a oneshot, but it has, like many things in my life, turned out to have a mind of its own. So I present to you, my Gummi Bear fanfiction. Here it is everyone! The one that started the madness! Lady Bane is looking for a way to rid herself of Igthorn's amorous pursuits once and for all. She hits upon a way, but she never gets the chance to use it. What harm can happen with this stone in the wrong hands? Find out here. We know how hard a long distance relationship is, even in our time. Back then, it is especially hard for Gruffi and Ursa. With the Winter Solstice approaching, will they decide their love is worth fighting for? 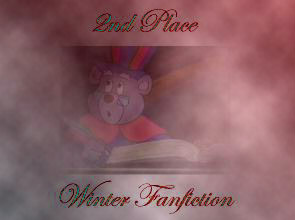 Placed 2nd in Ulisa Barbic's Winter Fanfiction Contest. Well, everyone's been asking me just where Tummi was during the Solstice Celebration in the last story. Here's your answer. And no, you're not getting any other hints than that. Happy Reading! Comments, questions, anything but flames? Write me here. Return to the Gummi Bears room.